When I launched my blog back in May, I was just beginning to work on my latest Philadelphia interior design project, a total-apartment redesign at the Ritz-Carlton in Center City. If you remember, its owner, a single guy in his twenties, was looking for a modern-minimalist aesthetic with a strong, masculine presence. In other words, a fairly dark palette punctuated by a few substantial pieces of furniture. A couple of weeks ago, we installed the wall coverings, our first tangible strides toward that end. By day’s end, they had completely transformed the look and feel of the space. Much is said about the power and convenience of paint, but wall coverings, in my eye, are even more potent. Certain materials and designs have an almost architectural effect, as though you raised the ceiling or added a wall. These coverings fall in that category. They’re fabrics usually associated with clothing—linen, wool, suede—much of them lined with pinstripes of various gauges. Basically, I dressed his walls in some beautifully tailored suits, which made the installation more like a fitting. If that wasn’t dramatic enough, I divided the apartment into two distinct halves. The front, where the foyer, living room, and kitchen reside, is all black. The back half of the apartment—the master bedroom and bathroom—is all white. I may also incorporate some navy by way of the bedspread to play off the navy pinstripes in the wall coverings. And eventually, all of the metal details will be silver. It may seem like every urban living space, the contemporary ones, at least, look their best when they carry a slight to severe edge. But I try to approach each home as a unique entity. 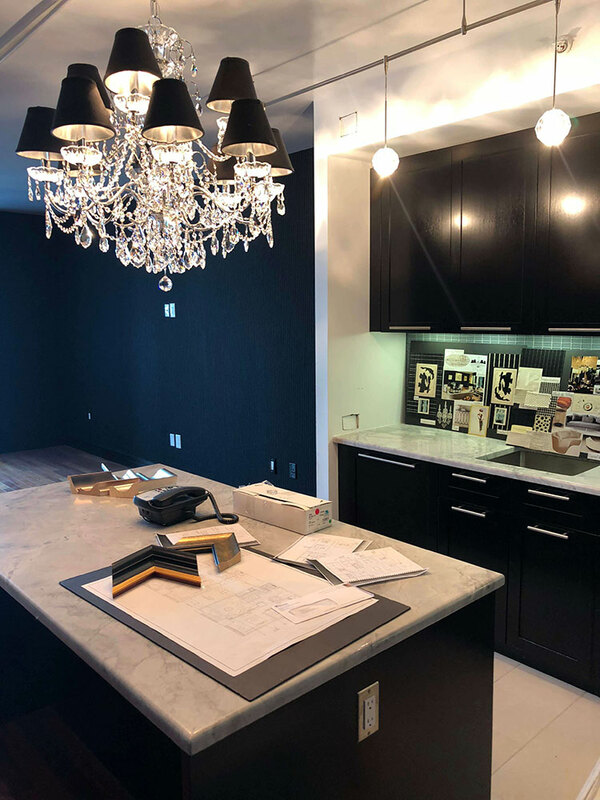 This particular Philadelphia interior design project was inspired by a single piece of pre-existing furniture: a black-lacquered, art-deco credenza. The homeowner wasn’t entirely sure what he wanted for his apartment, but he knew he loved that credenza. I did, too. So I started developing the concept from there. But as the design’s come along, I think he, too, has started to embrace his style, and it’s not entirely what I was expecting. As soon as the wall coverings were in place, we turned our attention to the next significant installation: the lighting. I showed him different kinds of art deco-style fixtures—all clean lines and modern designs—but he had another idea: crystal chandeliers. They paired well with the decadent suit fabrics, but they would throw us off our modern, minimalist, masculine course. I found some with marquise-cut diamonds that I plan to add miniature black lampshades to. Now that I’ve got a handle on our new angle, I think the chandeliers will add an intriguing nuance. And we’re not forsaking the apartment’s masculinity, after all. If anything, the contrast between the crystals and the wool and suede has made the space feel richer, warmer. The atmosphere, now, is closer to an update on a gentlemen’s haberdashery from the turn of the century. I seem to tap another vein in my creativity when I’m in the city. That’s how a casual foray into Philadelphia interior design became a full-fledged arm of my firm. And my lifestyle. A couple years back, feeling that pull and surge of inspiration, we bought our own apartment at the Ritz-Carlton and I embarked on one of the more audacious makeovers of my career. I’ll always feel at home in the suburbs—I love my gardens and my pond too much not to—but I’m more likely to encounter the unexpected in the city, as evidenced by this project, and those are the moments when I feel most alive.